Hello! 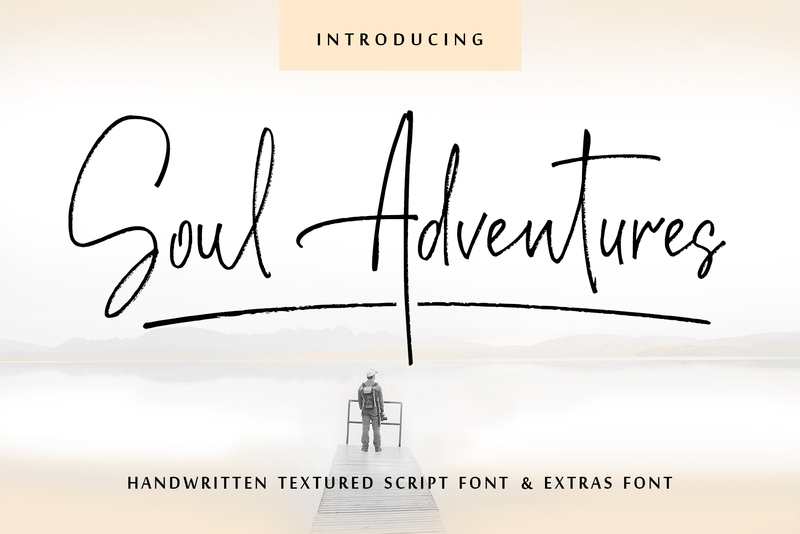 I’m very happy to present my textured script font Soul Adventures. Its hand look style makes it perfect for use in all your design projects be it logos, signatures, labels, packaging design, blog headlines. Also, it will look great in mugs, cards, gorgeous typographic designs, wedding stationery and much more. And additional font Soul Adventures_symbols can help you to make a lot of pretty designs and logos. Soul Adventures script font includes a full set of uppercase 2 sets of lowercase letters, numerals, a large range of punctuation and 70 ligatures, giving realistic hand-lettered style. For your comfort symbols that are included in Soul Adventures_symbols.otf font is also saved in vector (EPS 10) and PNG formats. You can choose either to type symbols or to add them as illustrations. Multilingual Support for Western European, Central, and South East European too, character set: ÁÂÄÀÅÃÆÇÐÉÊËÈÍÎÏÌÑÓÔÖÒØÕŒÞÚÛÜÙẂŴẄẀÝŶŸỲ áâäàåãæçðéêëèíîïìñóôöòøõœþßúûüùẃŵẅẁýŷÿỳ and more. A font family published by Ira Dvilyuk on Thursday, April 12th, 2018 that has 1,057 views so far.